Social media marketing is not a new segment in the marketing mix. Social media marketing is the extension of existing corporate communications to include social networks. Therefore, social media marketing cannot only be the task of a social media marketing manager. Rather, social media marketing is a challenge for the entire marketing organization, ultimately even for the entire company, which must learn to live in the categories and according to the principles of social media. Social media marketing is not a new segment in the marketing mix. Social media marketing is the extension of existing corporate communications to include social networks. Therefore, social media marketing cannot simply be the task of a social media marketing manager. Rather, social media marketing is a challenge for the entire marketing organization, indeed ultimately for the entire company, which must learn to live in the categories and according to the principles of social media. Many – not only small and medium-sized – companies still hesitate to use Facebook & Co. Our checklist is intended to give companies that want to get involved in social media marketing an initial orientation and provide concrete practical tips and tool knowledge. The checklist was created on the basis of our experience with the introduction of social media marketing strategies, especially in medium-sized companies. A social media strategy must always be developed on the basis of the concrete goals and requirements of the respective company. This document can therefore only be an aid in the development of a strategy. It does not replace an individual strategy development process and certainly not a necessary strategic orientation of storytelling. 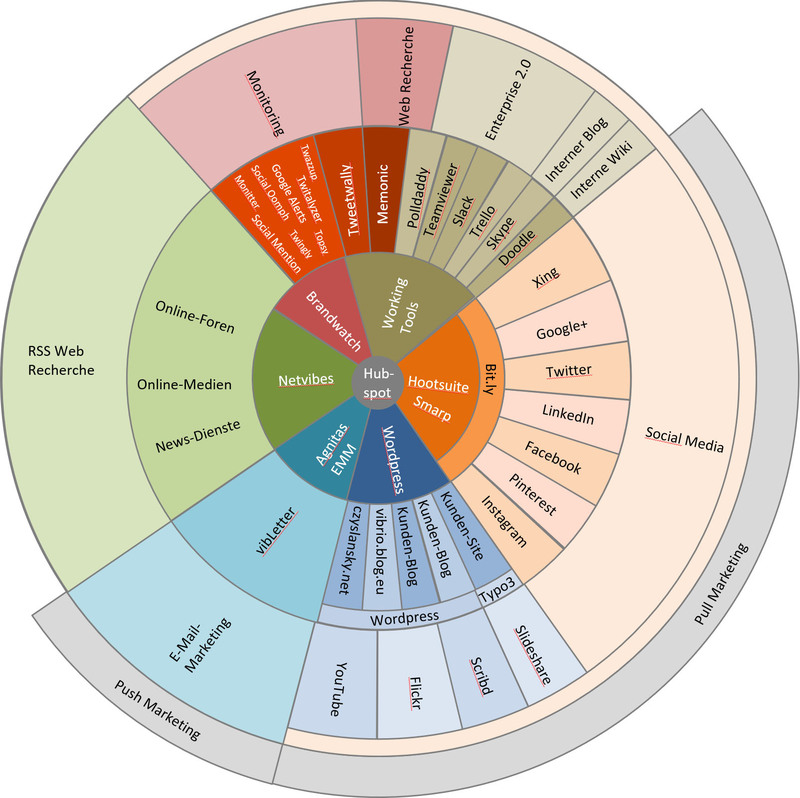 “Miks Social-Media-Miracle-Wheel” is an overview of all social media marketing tools currently used at vibrio. How important is increasing brand awareness? How important is the development of new markets? How important is generating new customer leads? How important is maintaining existing customer relationships? Do you want to enter into direct customer conversations via social media? How important is supporting the recruitment of new employees? How important is it to increase the efficiency of internal and external business processes (including supply chains and partner communication)? What are your target groups for all these tasks (industries, company characteristics, personal characteristics)? Social media marketing requires resources: working hours and specific skills. Therefore, it makes sense to start by taking stock of existing resources in your organization. For example, it is worth considering an internal bar camp (see definition) to which all employees are invited who are already privately active bloggers, tweets or active in Facebook, Xing, LinkedIn. The topic should be defined as the benefits the company or organization can derive from social communication or social media. In the sense of a classical “unconference”, only a few guidelines should be given. Because your goal is to find those employees who can support you in the management of social media and contribute their experience (monitoring, editing, technology, topic management). Social media communication differs significantly from communication 1.0. Social media marketing relies largely on employees and partners acting independently. Not only the management is afraid of losing control, but often the employees are afraid of the new responsibility: What can I say? What not? What happens if I say something that my company doesn’t like? Therefore, the development, adoption and implementation of social media guidelines is always necessary – regardless of whether concrete social media marketing measures are planned or not. We have prepared a template for a set of social media rules for you here. Before you worry about whether you will establish your own groups in Xing, initiate Facebook dialogues or make opinions in Twitter, you should first set up accounts. Not only is it legitimate, but it also makes sense to create customer accounts at least in Xing and on Twitter in order to get a feeling for what is communicated in which channels by whom in the first step by listening and reading. Recording of comments on one’s own brands, on the competition and on partners. Analysis of topics that can be used as the basis for corporate communication as part of an issue management strategy. Identification of opinion formers and opinion leaders on the topics and brands of your own company. The simplest way of monitoring is to create Google Alerts: search terms are permanently entered as “search orders”. Google will automatically send you an alert, either via email or RSS feed. Some time ago, we presented further recommended monitoring tools here. A much more convenient alternative is to create a monitoring portal in which Google Alerts can be combined with other search requests and clearly displayed. You can find out how to create this portal yourself here. Our professional monitoring tool that can also be used internationally in several languages is Brandwatch. After you’ ve defined your goals, researched your existing resources, and taken a first curious look at social media, you shouldn’t just get started or “just try Facebook”. You should design a social media strategy. Usually, you won’t do it alone. You will be looking for the support of an agency. It is crucial that you are not looking for the seemingly most creative agency, as you would with a Web 1.0 contract, but for an agency with strategic competence. What is required is not design, but integration and content. A good Web 1.0 agency had the task of building you an attractive, searchable and fast website. A social media agency must enable you to operate social media communication yourself in the medium term. This agency must understand your business requirements, know your resources, integrate your social media activities into the existing communication mix and support you in the development of content strategies. If you have no experience in dealing with such agencies, hire a pitch consultant. He or she will help you draw up the specifications for a pitch. It is better to invest a little money in a professional pitch consultant than to mislead an agency. This only leads to disappointments on both sides: You do not receive any relevant suggestions because the agency unintentionally misses the point. Social media marketing is dialogue-oriented publishing. Every social media channel therefore needs its own editorial and topic plan. Before you start a channel (for more on the channels see below), you should always have an editorial or topic plan that will support you for at least the first three months. The topics are generated from a wording strategy that combines corporate messaging and issue management. You can operate the various social media channels at least in part via uniform portal or editorial solutions. Three recommendable and partly free tools with which you can, for example, operate several accounts on Facebook, Twitter and LinkedIn are Tweetdeck and Hootsuite. A paid alternative that integrates monitoring and approval processes in addition to a central editorial portal is AGNITAS’ Social Media Manager, which will also integrate Xing in the future. All these services also automate the shortening of links, i.e. the shortening of long Internet links, in order to be able to integrate them more easily and space-savingly into tweets or postings. In addition, however, we always recommend creating your own account on bit.ly. This account gives you the opportunity to statistically evaluate the accesses and then to analyze which of your posts and tweets were particularly successful. a) Do not publish your videos directly on your website, but in a YouTube channel. Embed your videos from YouTube into your website (“embedded”) (an example). b) Do the same with all your brochures, flyers and presentations. Use a service like SlideShare (an example). c) It may be useful to do the same with images. For this you can use services like Instagram (an example) or Flickr. d) Integrate subscription options for your newsletter (reading tip) into these videos and documents. e) Advertise your social channels on your website and keep your employees, customers and partners informed about your presence in the social media. f) Promote your social channels among each other by linking or at least naming them. For example, tweet and post new uploads to SlideShare and YouTube. This can be automated to a large extent. g) Every description of a presentation, a brochure, a picture or a video on the platforms should contain a link to your website and thus serve the search engine optimization (SEO) of your website. There are so many social media that you can quickly and easily lose track. The selection of the most important media for you depends on your goals and your resources. Our matrix provides you with clues as to which channels are important to you and when. It helps you because we have rated social media according to their relevance to important goals with school grades. e) absolutely building a SlideShare channel; we recommend at least one Silver account for 19$ per month, in order to adapt the site to your corporate design and to receive statistical evaluations. n) Building your own corporate blog as a news part of a website, which can be easily integrated into social media. The monitoring described above is also absolutely necessary because no company is protected from suffering a reputation catastrophe on the Internet. A so-called “shitstorm” can arise from ignorance or misconduct in response to criticism in social networks. Here (German) we have summarized meaningful strategies against trolls, in dealing with critical customers and “anger-citizens”. A reference example for a Shitstorm we have played through as part of a university project and published here (German). For the ongoing development of your social media activities, you should set concrete goals from year to year. You can formulate targets for ranking values such as Klout and Peer Index or measure follower and friend numbers. We recommend evaluating the quality of Twitter followers via Audiense. Targets for transfer rates from followers to newsletter subscribers or the number of direct personal contacts from Xing relationships can also be formulated in targets. One instrument to measure the relevance of people in social media is Klout. We have put together a list here (German) of how you can use Klout and other measurement tools in a meaningful way. In general, the analysis and statistics tools offered should be critically checked to see whether they correspond to your own possibilities and the level of activity. In short: It can sometimes be better to conduct an intensive dialogue with a few “fans” on Facebook than to drive fan numbers upwards with the help of competitions without this leading to significant follow-up dialogues. A summary of the discussion about measuring success in PR and social media marketing can be found here (German). In recent months, vibrio has accompanied numerous medium-sized companies on their way to social media marketing. We always rely on an open Social Media Strategy Map. Together with the client, we formulate a concrete roadmap, which we continually revise in detail according to our experience. The social media strategy map is based on a slow and gradual acquisition of social media skills and coordination by marketing in coordination with sales, personnel and other specialist departments. The implementation of individual measures is then decided together with the specialist departments. Who (specialist department or marketing) leads the respective project must be defined internally. Lighthouse projects are initiated and implemented by Marketing.